Shop Qatar's third edition of exciting retail offers, fashion-forward events and spectacular entertainment concluded with a grand finale on Sunday evening. The closing ceremony, held at Doha Festival City's (DHFC) luxury hall, featured the fourth and final raffle draw, announcing the festivals' last 11 of 38 winners to win luxury cars and cash prizes worth QR3mn and was followed by a special music performance by rising Qatari star Aisha Aziani. “The festivals organised by Qatar National Tourism Council (QNTC) are curated to create unique experiences for residents and visitors while energising various sectors that contribute to the overall tourism experience,” Mashal Shahbik from QNTC said. "Shop Qatar has brought a strong start to 2019 and we look forward to giving our visitors new flavours to explore and enjoy at the tenth Qatar International Food Festival which will be announced soon,” she added. A series of fashion shows highlighted the activities at Shop Qatar's Design District. Children enjoying the Shop Qatar shows and activities. This year’s edition of Shop Qatar ran for 35 days and included all of the winter season's most exciting events and festivities. It kicked off with the first National Day Trade Festival from December 15 to 20, 2018 and continued with special retail, hospitality and entertainment across Qatar until January 20. 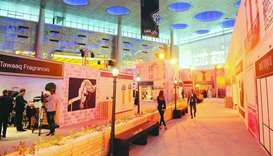 The festival's centrepiece attraction for this edition was the Design District, hosted at Doha Exhibition and Convention Centre from January 5 to 12. Over the course of eight days, visitors to the District were treated to a colourful showcase of fashion-forward events and activities - all under one roof. In addition to the 85 local and international pop-up shops, eight food and beverage outlets, there were daily fashion shows featuring 20 world renowned designers from nine countries and daily masterclasses with beauty experts, as well as engaging design dialogue at the Fashion Speakers Corner organised by Fashion Trust Arabia. In line with the India-Qatar Year of Culture, Shop Qatar was among the country's first events to celebrate Indian culture and provide avenues for cultural exchange. The Design District showcased the latest creations for renowned Indian fashion designers Tarun Tahliani, Namrata Joshipura, Raghvendra Rathore, Schulen Fernandes of Wendell Rodricks and Sanjay Garg of Raw Mango. “The layout and the feel of the District are very innovative and original. I am also glad to see the great response and participation of the Indian community at these events. I would like to thank QNTC for including these fashion shows to add value to the India-Qatar Year of Culture 2019,” the envoy added. In addition, Shop Qatar featured a live concert by famous Bollywood singer Arijit Singh who enthralled his audience at a packed Lusail Sports Arena on Friday, 18 January. The five winners of the QR10,000 cash prizes in the fourth and final week’s raffle draw are Zavarise Alessandro (222288), Mohamed Salah Almulla (293032), Abdelrahman Khalid al-ibrahim (224859), Zariha mat (293840), and Houssam Mohamed ahmadani (077348). The winner of QR 50,000 is Noura Yusuf Mohamed (384750) and the biggest cash prize of QR 100,000 went to Lulua Faisal Abdallah (380034). Four fortunate shoppers: Jassim Hillal al-Kuwari (220017), Abdalah Mohamed Sherif (217562), Dhamma Singh (361700), and Mohamed Said (295691) got to update their ride this year with Jaguar X- E (2018), Jaguar E- Pace (2019), Land Rover Discovery Sport (2019), and Range Rover Velar (2019) respectively. In addition to hosting the closing ceremony, DHFC had exclusive in-mall entertainment and roaming shows, and fun for the whole family throughout the month. “We hope that everyone enjoyed the fun festivities organised by QNTC as well as the live concert by Aisha. 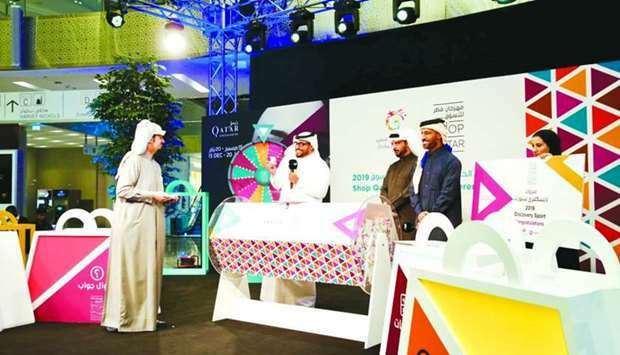 I would also like congratulate all the prize winners and thank our retailers who have contributed to this amazing event, ensuring we continue to create memorable moments for our shoppers,” Elzubeir said. Shop Qatar had 14 retail partners in Doha and beyond offering up to 50% discounts. 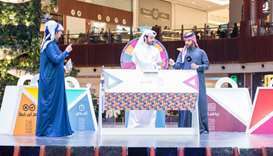 The participating retailers were in Al Mirqab Mall, Al Khor Mall, City Centre, Dar Al Salam Mall, Doha Festival City, Gulf Mall, Hyatt Plaza, Lagoona Mall, Landmark Mall, Mall of Qatar, Royal Plaza, Tawar Mall, The Gate Mall and The Pearl-Qatar. The Strategic Partners of the festival included: Fashion Trust Arabia, Katara Hospitality, Qatar Airways, Makeup District, Apparel Group, Alfardan Premier Motors, and Vodafone Qatar. Shop Qatar also featured two more live music concerts, one featuring Pakistani band Strings and singers Ali Sethi and Quratulain Baloch and another with famous American pop singers Bazzi and Boyce Avenue.